Kayla-Milan arrived at Care for Wild Rhino Sanctuary on the 16 August 2018 at around 5pm after being rescued in the Malelane area of the Kruger National Park after her mother was killed by poachers the night before. Park Ranger, Don English, escorted the orphaned rhino to the safety of Care for Wild via helicopter, with the help of Park Veterinarian Dr Peter Buss and his Helicopter Pilot, Grant Knight. Kayla-Milan was the second orphaned rhino that Care for Wild Rhino Sanctuary received on the same day. Fortunately for Kayla-Milan, she did not sustain any injuries, unlike the other orphan, Sophia, who was severely injured by hyenas. Kayla-Milan struggled with drinking milk from a bottle. Instead, for the first few days, she drank her milk from a silver platter, like the princess that she is. About 5 days after her arrival, Kayla-Milan finally took to the bottle and learnt to suckle very quickly. It’s only been a week since her arrival and Kayla-Milan is doing very well; she is on a regular milk schedule and has been enjoying her mudbath regularly! On the 7th September 2018, Kayla-Milan was introduced to a crash of surrogate rhinos where they took her in immediately and became very protective of her. Then on the 8th of October 2018, Kayla-Milan was introduced to Sophia, the other orphaned rhino that arrived on the same day as she did. Their bond was formed instantly and have not left each other’s side since. Kayla-Milan is now Sophia’s comfort and has taken to looking after Sophia with a great heart. 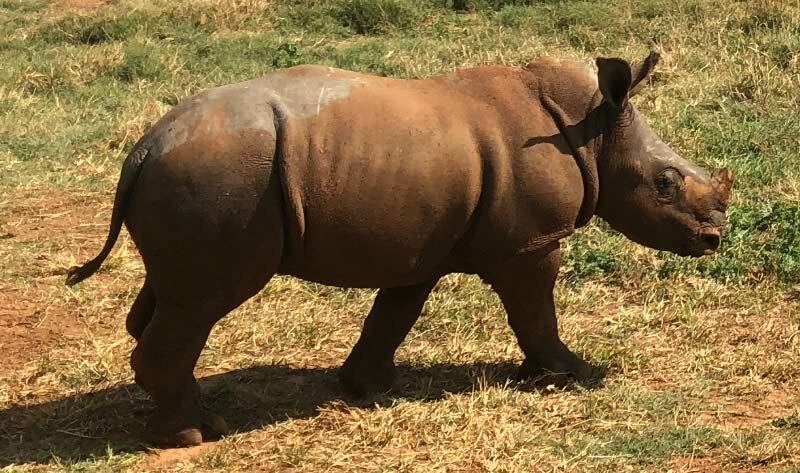 She helped Sophia meet the older surrogate rhinos on the 23rd October 2018 and then met some other younger orphans (Khanya, Rose, Rubybelle and Fern) the following week. Kayla-Milan is now well on her way to growing up among a big crash of rhinos where she will spend her days eating, napping and mud-wallowing until her future release, and beyond.